The European Robotics Forum 2018 (ERF2018) in Tampere brought together over 900 attendees from robotics academia and industry. 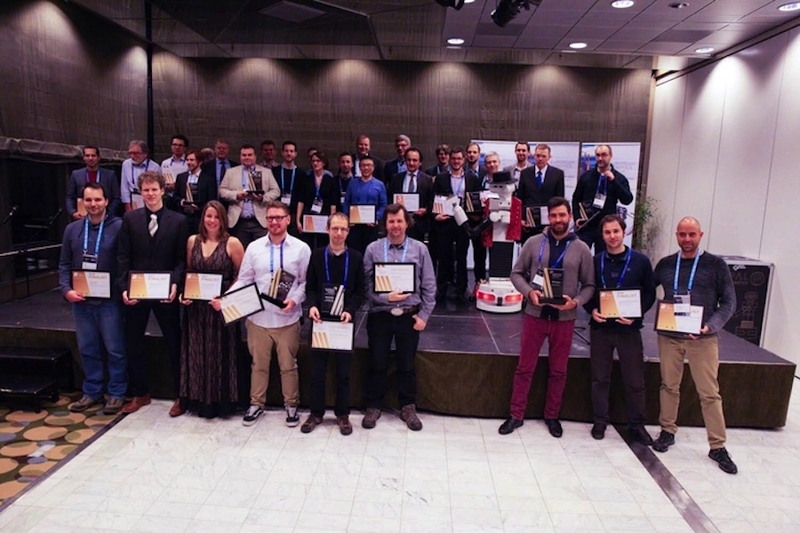 To bridge the two, euRobotics hosted the Georges Giralt PhD Award 2017 & 2018 and the TechTransfer Award 2018, during a Gala Dinner event on 14 March, in Tampere, Finland. The aim of the euRobotics Technology Transfer Award (now in its 15th year) is to showcase the impact of robotics research and to raise the profile of technology transfer between science and industry. Outstanding innovations in robot technology and automation that result from cooperative efforts between research and industry are eligible for the prize. The First prize went to Germany’s Roboception: rc_visard – 3D perception & manipulation for robots made easy team, composed of Michael Suppa, and Heiko Hirschmueller from Roboception GmbH, and Alin Albu-Schaeffer from the Institute of Robotics and German Aerospace Center (DLR). The Second prize went to Germany, to the project Mobile Agricultural Robot Swarms (MARS), created by a team made up of Timo Blender and Christian Schlegel, from Hochschule Ulm, and Benno Pichlmaier from AGCO GmbH. The MARS experiment aims at the development of small and stream-lined mobile agricultural robot units to fuel a paradigm shift in farming practices. The Third prize went to Smart Robots from Italy, a team made up of Paolo Rocco and Andrea Maria Zanchettin, from Politecnico di Milano, and Roberto Rossi, from Smart Robots s.r.l., Italy. Smart robots provides advanced perception and intelligent capabilities to robots, enabling new disruptive forms of collaboration with human beings. The Finalist was the In situ Fabricator (IF), an autonomous construction robot from Switzerland, with a team made up of Kathrin Dörfler from Gramazio Kohler Research, ETH Zurich, NCCR Digital Fabrication, Markus Giftthaler and Timothy Sandy from Agile & Dexterous Robotics Lab, ETH Zurich, NCCR Digital Fabrication. The members of jury of the TechTransfer Award were: Susanne Bieller (Eunited Robotics), Rainer Bischoff (KUKA), Georg von Wichert (Siemens), Herman Bruyninckx (KU Leuven), Martin Haegele (Fraunhofer IPA). The euRobotics TechTransfer Award 2018 is funded by the EU’s Horizon 2020 Programme. The Ceremony saw the handing of the European Robotics League (ERL) Awards: ERL Industrial Robots and ERL Service Robots, and ERL Emergency Robots. Points are awarded by attending local and major tournaments, not a central event, with three main objectives: strengthening the European robotics industry, pushing innovative autonomous systems for emergency response, and addressing societal challenges of aging populations in Europe. The European Robotics League is funded by the EU’s Horizon 2020 Programme.